Finding the exact location shouldn't be so hard. Delvepoint makes it easy to spot! Find the exact data you're looking for with Delvepoint... no matter how big the haystack. Finding exactly what you are looking for requires the right key. Delvepoint is a perfect fit! Get more data features results with Delvepoint. Data is available everywhere. With Delvepoint you'll get a more efficient, more secure, feature-rich skip tracing tool. Don't waste time digging through old-fashioned reports, when time can be your biggest advantage. 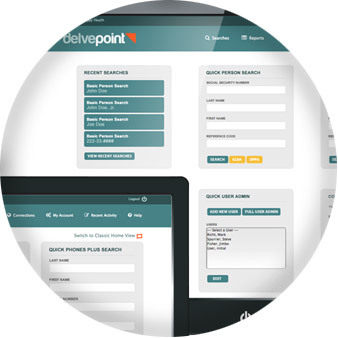 Find People, Locate Assets, Track Criminals Delvepoint offers the best data, at the best prices, with the most features! With Delvepoint, you’ll get a more efficient, extra secure, feature rich skip tracing tool. Don’t waste time digging through old-fashioned reports with out-dated information, choose Delvepoint to find the right person, business or asset with the first click. Intuitive and easy-to-use interface that works everywhere you work. Customize at every level; control everything with a simple click. Organize and run thousands of records with an easy and customizable input and output. With MFA and advanced controls, your account and sensitive information is always protected. All searches and reports automatically saved for 90 days! Organize and save information forever in your Vault. View familial relationships and associates with an editable, clickable interface. Search faster with quick search widgets designed for one-click access. Get a quick warning when you run the same search within 24 hours! Track individuals 24/7 and receive alerts when they are arrested or booked. 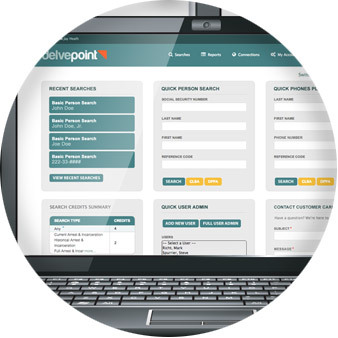 Delvepoint serves all businesses that need access to high quality background information. To see specific ways Delvepoint can deliver for your industry, click here. With a streamlined interface, Delvepoint makes it easy for you to see the information you need and act on it. Find out the specifics here. Connect with us online, on the phone, or in person. Click here to contact us. Delvepoint offers more searches reports features for Skip Tracers. Make your data do more with Delvepoint's unique platform. Delvepoint helped my team save time and money — the perfect combination. 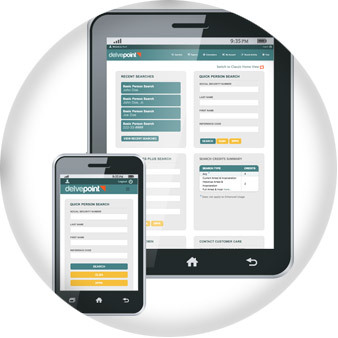 When looking for the most accurate right-party-contact information, Delvepoint beat the competition. We've moved from transactional searching to complete batching, and Delvepoint can keep up. They're the perfect fit in my waterfall — for price, accuracy, and customization. I love not having a long-term contract. I want to search when I want to, where I want to. Delvepoint makes it easy for me and my investigators. It's like having an assistant. Between the Vault folders and custom exports, I can turn around reports faster than anybody else. Copyright © 2019 UDT Group, LLC. All Rights Reserved.